We have had a fun and busy week and are now getting ready for Christmas Day. I am off work until we go to Indiana and enjoying spending time with the kids. Silly Abby. This past weekend we hosted a Christmas Brunch for Patrick's mom's side of the family. Abby playing with Jessica. She just loved her. Carter, Ian and John Mark playing in the playroom. As the boys get older, they have similar interests. Later that evening, we headed to Aiken to see Patrick's dad's side of the family. Here is Abby with her new pet carrier. Carter was busy learning how to tackle and wrestle during this fun time. Just the beginning of holes in his jeans. On Sunday evening, we went to the lights at the zoo. It was cold for here, so we were bundled up. Carter is getting the hang of posing, Abby on the other hand, wanted nothing to do with the whole thing. Me and the kids... Please excuse the silly headband. I was cold, but did not realize what it looked like. oops..
Abby did wave at a few of the lights by the end. We went to a Polar Express showing at a Chick fil a and there was a Santa Cow. Again, Abby was not up for the festivities. She is a little on the opinionated side. Today, we went to visit Ms Fulmer. She was a former patient of mine and played the organ at our wedding. She is 92. Carter took this picture of her with me and Abby. Carter and Ms. Fulmer. She is so sweet and still plays the organ at hotels during the week and at her church. Carter had his school Christmas program. He is 3rd from the left in the green Santa sweater. We got a new camera and I am still learning a little. There he is doing the motions. 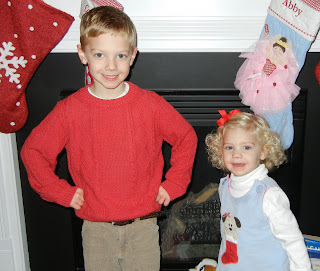 Love his sweater, my grandma made it for me when I was about 7 or so.... She made them for the grandkids and now I have them for the great grandkids to wear. After the performance in his sweater. Such a big boy. I tried for a picture together, but that really is just tough these days. Here is Abby in one of her Christmas outfits. Abby all decked out for Christmas. Carter has been taking Karate at school and he was able to go for his 3rd junior belt last week. Getting his blue belt with his instructor. Hopefully, I will update more this weekend. We have lots of fun things planned. We had the privilege of my grandma coming to visit us from Michigan last week. Each year we have a holiday open house and my grandma came to help with the preparations and the actual open house. As you can see, she was Mrs. Claus. She made the outfit and looked wonderful. Carter and his Grammy. Notice, his Elf on the Shelf behind him. He loves getting up and trying to find it each day. Ours is named Sparky. Abby and her cousin Neely. Abby, Carter, Ian and Neely. All Cousins. Carter and a few of his friends. Grandma, Abby and me before the evening began. During the day, we had lots to get done, but Abby decided to just chill in her chair. Grandma making goody bags for the guests. Abby helped with the cookies and the sugar, but as you can see, she had to take a break to talk on the phone. Grammy reading a book with Abby. Grammy reading a book with Carter. We had a great time and I am so thankful that she was able to come visit us. Such a special memory. More Holiday pictures to come in the next few days. Just wanted to wish everyone a Happy Thanksgiving. Here are two of the many things that I am thankful for. This morning we made monkey bread. Carter had a great time helping out. Abby was too jealous that Carter was sitting on the counter and she refused to get there with him that she got to sit on the stairs the whole time. She is full of drama. I was one of the room mother's for Carter's class this week. Here are the turkeys that I made. They looked a little better if you did not zoom in on them. I am not exactly the neatest as the little details. The kids loved them. Abby in one of her thanksgiving outfits. It really was not much, but Abby always had hair in her face if you did not pull it back with a rubber band. I went once before just to get a little trimmed off the front and the hairdressers said that she needed it trimmed all over. I was not ready for that, so I cancelled and rescheduled. Here she is before getting the little bit trimmed. When I say a little, that is really all it was. Don't worry, I would not have let them cut much on the curls. She did get some off of the top with a little layering and now it is even curlier. Abby sat on my lap and did a great job. Never moved at all. We were shocked because Abby is very spirited. Abby getting the top trimmed. Carter and Abby this morning in their Halloween Pajamas. On Monday night we carved a pumpkin. Abby was not too excited to get near the pumpkin. Carter took this picture of me and Patrick. The carving process. What is daddy doing? Carter and Abby enjoying the Halloween Cookies that Grandma made them and sent back with me. On Tuesday we went to Boo at the Zoo. Abby did not say Trick or Treat but enjoyed going to get the candy. Carter at Boo at the Zoo. Abby showing me her sucker that she opened. She did not like it but enjoyed showing it to me. We ran unto my friend, Kasey, her husband and son, Heyward at the zoo. We tried for a cute picture, but this is all that we got. Abby just stared at him and he made sounds at her. Too Cute. Abby at school on Friday. She dressed up in the morning but they changed for the afternoon. Here she is posing. Last night we went to McEntire, where Patrick works for a Halloween party. The kids got to go on a Hay Ride for candy. Lots of fun. Abby enjoying her pom poms.